FILE - French President Emmanuel Macron delivers a speech prior to attend a dinner organised by the French Council of the Muslim Faith (CFCM) to break the fast of Ramadan, in Paris, June 20, 2017. Six months ago after a string of jihadist-inspired attacks in London and Manchester, British Prime Minister Theresa May said the time had come to have “embarrassing conversations” about Islam’s place in Britain. Her comment was sparked by claims that the country’s Muslims weren’t doing enough to counter extremism and jihadist propaganda. FILE - British Prime Minister Theresa May is seen during a meeting at 10 Downing Street in London, Britain, Nov. 27, 2017. So far, mired in Brexit controversy, the British government hasn’t started a debate in earnest. But on the other side of the English Channel, French President Emmanuel Macron is proposing a root-and-branch reform of Islam in France — a project being closed watched by the British and by other Europeans. Macron’s goals, he said, are to preserve “national cohesion” and to counter Islamic fundamentalism. Another key reform goal is to halt the influence of Arab states on France’s 6 million Muslims by way of the funding of mosques and paying clerics. FILE - A woman wearing a headscarf walks down a street in Paris, France, July 22, 2013. “Why is the question of funding of Islam central for us? Because today, we know that the funding comes from foreign countries, and it is not desirable to have a religion in France funded by foreign countries who in fact will be defending their interests. And so, it’s a political Islam,” he said. The plans being considered by the French president — including requiring imams to pass courses on secularism, civil liberties and theology, and the appointment of a chief imam as the sole religious authority over French Muslims — are drawing fire from some socialist politicians and Muslim leaders. They argue government meddling in the training of Muslim clerics and interference in Islamic religious affairs would undermine the principles of freedom of conscience and the separation of church and state, underpinnings of the French state’s strict brand of secularism known as laïcité, which is enshrined in a1905 law. Macron has been rebuked by some key Muslim leaders, including the head of an organization set up more than a decade ago to encourage the development of a homegrown form of Islam more in tune with traditional French values. “The Muslim faith is a religion, and as such, takes care of its own household affairs. The last thing you want is the state to act as guardian,” Ahmet Ogras, president of the French Council of the Muslim Faith (CFCM), told Reuters. 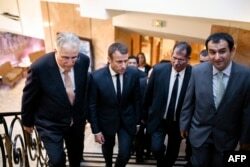 FILE - (LtoR) Vice President of the French Council of the Muslim Faith (CFCM) Chems-Eddine Hafiz, French President Macron, CFCM President Anouar Kbibech and CFM Vice President Ahmet Ogras, arrive to attend a dinner organized by CFCM, June 20, 2017. Macron has said he won't unveil a detailed reform proposal until wide consultations take place, but left-wing critics say his ideas risk undermining the state’s religious neutrality and will pull the French government into the management of religion. "The president’s plans to restructure Islam in France call into question the 1905 law separating church and state,” said Benoît Schenckenburger, an adviser to left-wing leader Jean-Luc Mélenchon, a challenger in last year’s presidential elections. “The state cannot influence the organization of Islamic institutions, cannot meddle in the training of imams and cannot weigh in on how Islam in France is to be financed." Critics point out that Macron never talks about the state managing Catholic and Protestant churches or overseeing how Judaism is exercised. But those supporting Macron say French Catholics, Protestants and Jews accept laïcité and that no threats to the state are being mounted from within their communities. 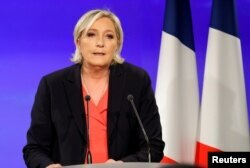 FILE - Marine Le Pen, French National Front (FN) political party candidate for French 2017 presidential election, concedes defeat at the Chalet du Lac in the Bois de Vincennes in Paris after the second round of 2017 presidential election, May 7, 2017. Macron first announced his intention to reform French Islam in an interview a week ago with the French newspaper Journal du Dimanche. “What I’d like to get done in the first half of 2018 is set down markers on the entire way in which Islam is organized in France,” he said. France isn’t alone among European states in struggling to formulate ideas about how to counter jihadists, harmonize Islam with Western ideals and to come up with ways of encouraging greater integration of Muslims. 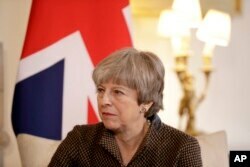 He has drawn praise from British conservatives frustrated with what they argue is a muddled approach by the May government.